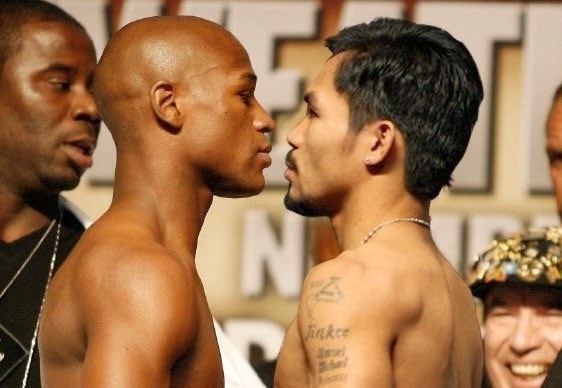 This is one great news today, for 3 top competing Television Networks in the country has unite to air the much-awaited and highly anticipated fight of the century, "The Mayweather-Paquiao fight" this coming May 2, 2015. The announcement was made during a presscon held by ABS-CBN, GMA 7 and TV5 with Solar Sports today, March 26, 2015. With this, our beloved Pambansang Kamao bid his 'thanks' to all the party involve via skype. Paquiao also thank Solar Sports CEO Wilson Tieng for making this unity possible for the benefit of all the Filipino boxing fans all over the country. Aside from Televisions, the Mayweather-Pacquiao bout will also be shown in 100 SM Cinemas nationwide. Comments or suggestions about "3 Local Networks to Broadcast Pacquiao-Mayweather Fight in May 2" is important to us, you may share it by using the comment box below.